F.C.C. TSR Honda France has won the 24 Heures Motos and made history into the bargain. This is the first time a Japanese team has made it to the top step of the podium at Le Mans, finishing ahead of British squad Honda Endurance Racing and BMW-mounted German team Wepol Racing by Penz13. The 41st edition of the 24 Heures Motos will go down in history for several reasons. The most notable one is the victory of the Japanese team: a Honda France partner this season. Three-time Suzuka 8 Hours winner F.C.C. TSR Honda France today became the first Japanese team to win the 24 Heures Motos. By doing so, the squad handed tyre manufacturer Bridgestone its first Le Mans victory, and shot to the top of the 2017-2018 FIM EWC provisional standings. F.C.C. TSR Honda France had previously won a spot on the championship podium in 2016, but today the squad’s determined riders Freddy Foray, Alan Techer and Josh Hook finally enabled Honda to once again taste victory at Le Mans. The brand’s last win here dates back to 2006, with National Motos. Another Honda team was also on the podium: British squad Honda Endurance Racing. Gregory Leblanc, Sébastien Gimbert and Erwan Nigon did a fantastic climb back up after slipping down to 38th place in the early stages of the race due to an electronics problem. Germany was represented on the podium too, by Wepol Racing by Penz13. The BMW-mounted team comprising Michael Laverty, Christian Iddon and Daniel Webb ran a superb race despite a crash and all the pitfalls of a 24-hour race. Wepol Racing by Penz13 had picked up 2nd place at the Bol d’Or last September. Three nationalities were represented on the podium, and three tyre manufacturers: Bridgestone, Dunlop and Pirelli, in that order. An absolute first. Switzerland narrowly missed a podium place: Kawaski-mounted Bolliger Team Switzerland’s all-Swiss line-up (Roman Stamm, Robin Mulhauser and Sébastien Suchet) finished fourth. In 5th place (and deserving of a mention for sheer tenacity) was Team SRC Kawasaki. After lapping in front in the early part of the race, a crash followed by a radiator problem saw the team plunging to the bottom of the rankings. But Randy de Puniet, Mathieu Gines and Jérémy Guarnoni rode hard and doggedly for the full 24 hours to finish in the Top 5. Their perseverance netted Team SRC Kawasaki the Anthony Delhalle EWC Spirit Trophy, which rewards a team’s fighting and competitive spirit. The 2018 24 Heures Motos will also be remembered as an action-packed race peppered with upsets. Many of the leading teams had a rocky time of it. YART Yamaha had no choice but to withdraw following a crash. BMW-mounted NRT48 threw in the towel because of an electronics problem. Tecmas BMW was stopped by an engine breakdown. Suzuki Endurance Racing Team was afflicted by brake problems and finished far back in 24th place. GMT94 Yamaha, which was constantly in the lead for 557 of the race’s 843 laps, lost its footing after two crashes and finished 10th, just behind Mercury Racing. 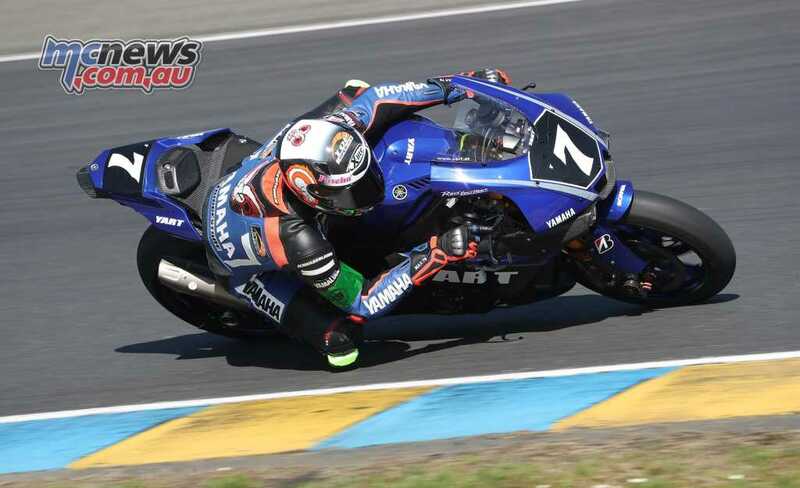 76,000 spectators were at Le Mans to watch the 41st edition of the 24 Heures Motos. Next race on the FIM EWC calendar: the 8 Hours of Slovakia Ring on 12 May. 3ART Moto Team 95 (Yamaha/Alex Plancassagne, Matthieu Lussiana and Pepijn Bijterbosch) got the upper hand in this category, coming in on the heels of the factory-backed Kawasaki after a hassle-free race, just ahead of Moto Ain (Yamaha/Roberto Rolfo, Alexis Masbou and Christoffer Bergman) and Junior Team Le Mans Sud Suzuki’s Hugo Clère, Alex Sarrabayrouse and Louis Rossi (the Suzuki-mounted team was also on the Superstock podium at the Bol d’Or).